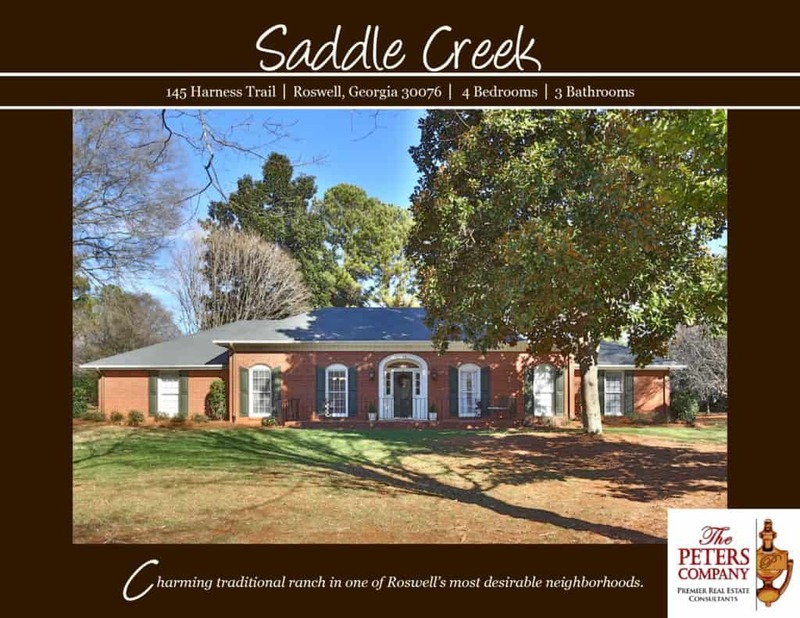 Just Listed :: Amazing Ranch in Roswell's Saddle Creek! Welcome home! This Chatham built brick ranch in Saddle Creek is just what you’ve been looking for! The flowing floor plan, custom features, and charming character of this home will never go out of style. Being located in a wonderful neighborhood with easy access to GA-400 makes commutes a breeze. You’ll also have easy access to the highways, byways, and activities that make this location such a well loved destination! Being in this popular area also means you can enjoy many nearby restaurants and shopping spots, including those in historic downtown Roswell! Huge corner lot is almost an acre in size! Loaded with thoughtful touches, custom features, and a great flowing floor plan. Kitchen features stainless steel appliances, granite counters, island, pantry, and spacious breakfast area. Large living room has vaulted ceiling and wood burning fireplace with stone surround. Master suite is a true retreat including a walk-in closet and spa-like bath with double vanity and slate tile shower. The patio is ideal for outdoor enjoyment while looking out on the level backyard. A two car garage easily fits vehicles and has extra storage space. Wonderful neighborhood amenities include a pool, tennis courts, clubhouse, and multiple playgrounds.